In 2006 AMS emerged as an industry leading provider of Fuselage Lifting Systems when we conducted the first CAT3 lift of a B747. To date we have produced and supplied almost fifty CAT1, CAT2 and CAT3 Fuselage Lifting Systems worldwide. A nose gear collapse is the most common aircraft incident that can occur at an airport, and our customer base strongly suggests leading airports realise this piece of equipment is an essential part of their runway protection programme. The confidence shown by them in choosing AMS underlines our claim that AMS’s Fuselage Lifting System is the leading product on the market. We firmly believe it offers the best return on investment of any piece of recovery kit, not least because of the flexibility of the modular system we designed. The Fuselage Lifting System (FLS) offers the capability to lift either the nose or the rear of the aircraft fuselage. The modular format allows AMS to continually improve the system to accommodate changes in aircraft design and size, e.g. upgrades for the B787 have already been supplied to two major airlines. Our FLS offers a totally modular aircraft recovery solution that is fully upgradeable to CAT2 and CAT3: the assembly configurations are endless. It is air transportable and can be used on at least 26 of most commonly used civilian aircraft in use today. A number of smaller airport authorities have purchased the CAT1 version of the system with the strategic aim to use the upgrade options as their airport expands. The world’s military have also realised the versatility of the FLS. 15 units are currently spread amongst four of the world’s largest military air forces. All our systems were designed and constructed to satisfy the compliance requirements of both the Boeing and Airbus Aircraft Recovery Manuals. We continue to work with major aviation industry decision-makers and aircraft designers, to develop aircraft lifting equipment to cater for the growing needs of the industry. In 2014 AMS demonstrated the versatility of the FLS by hosting a live event at our training ground to 70 of the world’s leading aircraft recovery experts. It was the first time this type of event has been conducted in front of an audience. This was no “fire training aircraft” – it used a real A340 in a nose-down crashed position and also employed our 50 tonne turntable: the first aircraft recovery turntable designed to cater for the A380 and other wide-bodied aircraft. You can view this unique event and see the CAT3 version of the FLS in operation by clicking here. Worldwide sales of our Fuselage Lifting Systems have exceeded our expectations, while feedback confirms the equipment has surpassed the expectations of our customers too. Aircraft numbers continue to rise and airports are under pressure to expand and grow; all of which increases the potential for aircraft incidents, including nose gear failures. 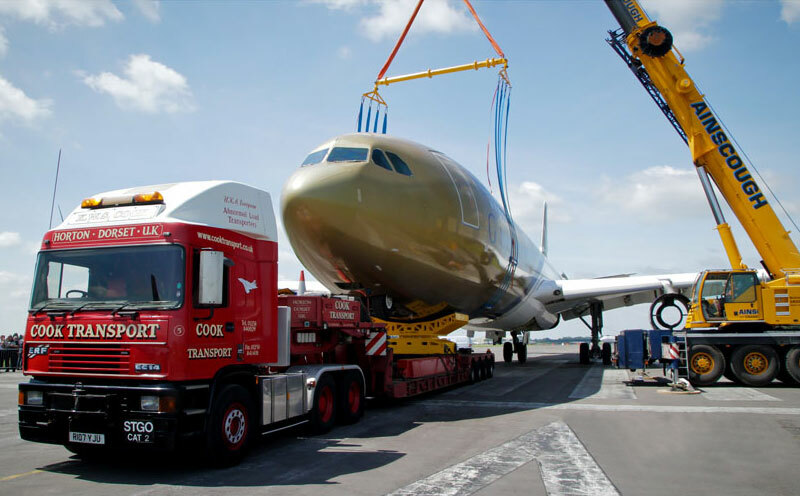 Rapid recovery is essential to maintain airport operations so can you afford not to have an AMS Fuselage Lifting System as part of your aircraft recovery equipment? For more details on the FLS and AMS’s comprehensive range of aircraft recovery equipment please call us on +44 (0)20 3289 9320, or contact us using the form on our website.